Silkspan—what’s that? 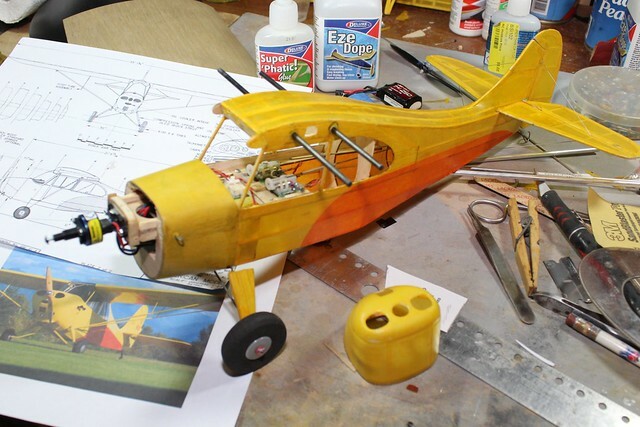 Simply stated, it’s a unique kind of paper that, since the pre-World War II days of aeromodeling, has been recognized as an excellent covering material for model airplanes. More specifically, it’s a specialized tissue made from woody plant fibers. It’s my understanding that most of it comes from Japan. Silkspan is a specific type of tissue paper. Not all tissue from Japan is silkspan; however, you’ll recognize its subtly mottled appearance when you see it. Silkspan is the model airplane world’s name for teabag paper. Japanese tissue is a lighter, finer-grained paper made from the gampi plant and sold in the US model airplane market under names such as Esaki. It is usually more delicate and demands slightly different application techniques. When I started in this hobby during the late 1940s and early ’50s, silkspan had long been accepted as the default covering for all but the smallest—and largest—model airplanes. In those days, nearly all of the kit manufacturers included a couple sheets of silkspan in every box as the recommended covering material. Modelers knew it was supposed to be attached, sealed, and finished with airplane dope. Most hobby shops no longer carry silkspan (or any other tissue-type covering), and the person behind the counter might not even know what it is. Quite a few specialized dealers sell it, mostly online, but let’s start the easy way. Guillow’s, the company whose models are featured in this series, not only includes silkspan in its larger kits, but will sell it to you separately. This is a sheet of OO silkspan directly out of a Guillow’s kit box. Silkspan that was available to us then (and now) came in three weights/thicknesses. OO silkspan was lightweight and comparable to heavier tissue products. It was good for little models with wingspans on the order of 12 to 18 inches. OO silkspan has another application that works well on larger models. I’ll describe that later. Gas Model (GM) silkspan is noticeably thicker, stronger, and the most commonly used. Super Gas Model (SGM) silkspan was also on the hobby shop shelf if you were building a 6-foot aircraft and couldn’t afford to buy stronger, more expensive silk. If you opened a kit from Sterling, Goldberg, Berkeley, Top Flite, PDQ, Midwest, Kenhi, Veco, or others, you expected to find a couple of included 2 x 3-foot sheets of silkspan. This was common throughout the 1960s, long after most model builders had come to prefer various plastic film covering products. You will still find silkspan in the larger Guillow’s built-up balsa kits today, which will lead us into this lesson on an old aeromodeling skill. Regardless of the grade of silkspan that you chose, if you were an experienced model builder, you had already learned to apply covering over every square inch of the model’s surface, including the “closed” parts such as sheet balsa or carved balsa blocks. If you left any balsa structure uncovered/unsealed by silkspan, you would have a rough, porous surface that was nearly impossible to finish to match the covered areas. A colored dope finish might help disguise the contrast between the silkspan and the bare, open-grain balsa around it, but even adding and sanding multiple filler coats or sealer products could not give you a finish to compare with silkspan over everything and a couple of coats of clear dope. Most of us learned the hard way that if the color finish included enough coats of sanding sealer/filler coat over bare wood to hide it, the extra weight pretty much guaranteed a nonflying airplane. Building smaller airplanes using colored dope containing heavy pigments was something to avoid if we wanted them to fly at all. These are the two Guillow’s Kit No. 403 Spitfires that the author discussed in his July 2018 Model Aviation article about Guillow’s kits. They provide an excellent example of what dyed silkspan covering looks like when it’s attached and sealed with Deluxe Materials Eze Dope. No matter how you planned to finish it, silkspan could be applied dry by sealing down all of the edges of the piece you were working on then spraying it with water. When it dried, it would shrink enough to pull out most of the wrinkles. The alternate method that most of us preferred was to premoisten the silkspan with water then take advantage of the resulting flexibility and stretchiness, pulling the covering tight and flat, even over shallow compound curves such as the wing’s top surface. As the water evaporated, the covering would shrink itself smooth. After you became used to working with the more delicate, fragile, wet silkspan, you were practically guaranteed a tighter, neater covering. Regardless of how it was adhered to the frame, a silkspan covering was sealed and strengthened by adding several coats of clear dope. You usually stopped adding coats when the silkspan began to remain noticeably shiny after the dope dried. Using more dope added weight, but even worse, it always threatened to overtighten the covering and warp the structure. There are different types of dope and a variety of techniques for using it, but they all came with a really strong smell. Even if you didn’t mind it, everyone else around you did, and that is one of the best reasons why many model airplane builders stopped using dope and silkspan when they discovered plastic coverings. Several new products for attaching, sealing, and surfacing silkspan and other types of tissue have become available from Deluxe Materials. The products do all of the things we want the dope to do, but they don’t smell and they can’t shrink too much. I will explain more later, but right now I want to discuss another silkspan characteristic that expands its usefulness. Silkspan, which is naturally white, used to be available in multiple colors. You could find red, yellow, orange, blue, green, black, or even checkerboard-pattern silkspan in red or black. The colors were generally stocked on hobby shop shelves next to the white silkspan. Can you imagine a model covered with deep golden translucent silkspan, sealed and turned glossy with five or six coats of clear dope, and glowing in the afternoon sun at some grassy flying field? This is the effect that those transparent, colored film products have been trying to reproduce for years. If you have ever seen a well-executed, clear-doped, colored silkspan (or silk) covering, you might agree that they have not yet managed to get it right. Enough of the history lesson. I have chosen clear-doped, colored silkspan as the covering and finish of choice for my ongoing series of electric RC conversions of Guillow’s traditional stick-and-tissue balsa models. The photos and additional material online and in the digital edition will explain how to use silkspan differently than what was done in the past and explain why using Deluxe Materials products is such a good idea. I still have my Spitfire from 40 years ago, though the tissue is splitting now. She needs to be recovered. Pactra and Formula U is no more, so it's nice to see you can still get dope-like products. I still have all of my old dope paints...maybe I'll buy me another stick & tissue model!